He did it again. Again. 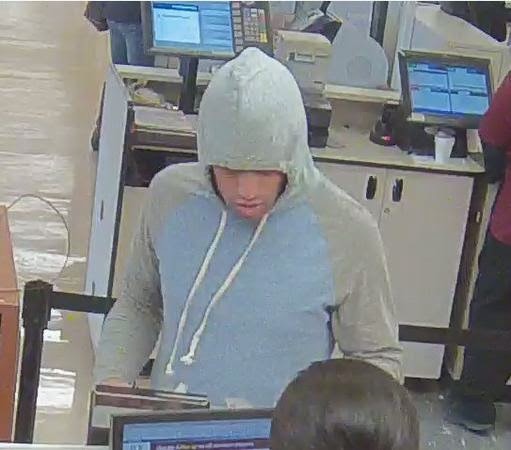 A serial bank robber who made his debut at the TCF bank inside of Boystown’s Jewel-Osco store last Sunday struck again this morning at the TCF bank inside of the Jewel-Osco store at 2940 N. Ashland. On Friday, he robbed the TCF bank inside of the Jewel-Osco at 4355 N. Sheridan on Friday. After passing a note to the teller at 9:43 this morning, the robber fled with about $1,200 in cash. He was last seen heading south toward Ashland. No weapon was displayed. No dye pack was given. A witness from this morning's robbery says the offender may have a blackened left eye. The FBI, which has positively connected today's incident with the two earlier cases, describes the offender as male, Hispanic, 5'9" to 6' tall, slim build, late 20's to early 30's. He sported facial hair in his first hold-up, but has since shaved that off. This surveillance photo is from today's hold-up. Images from the Boystown robbery are posted HERE.